Oak Island is a privately owned island in Lunenburg County on the south shore of Nova Scotia, Canada, spread across an area of 57 hectares. The island is fully covered by trees. It rises to a maximum of 11 meters above sea level. It is best known for the possible buried treasure or artifacts and its exploration. 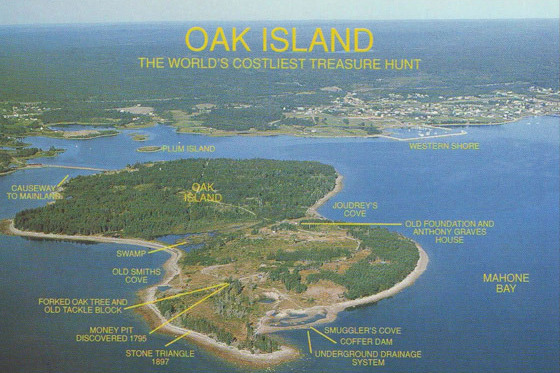 Oak Island is one of the world’s deepest and most costly archaeological digs. The treasure hunt carried on site is also the world’s longest and most expensive treasure hunt and indeed one of the greatest unsolved mysteries of the world. On a summer day in 1795, a teenager named Daniel McGinnis was roaming on the Oak Island when he found a shallow depression in the ground. Above this depression, there was a tree whose branches were cut in a way as if as if they had been used like a pulley. Daniel had heard the tales of pirates, so he decided to return with friends on the next day for investigating the hole. McGinnis worked on the hole with his friends John Smith and Anthony Vaughan for some days. Two feet below the surface, they found a layer of flagstones. 10 feet further in the pit, there was a layer of oak logs. Proceeding at 20 feet and 30 feet, they found the same layer of logs. Daniel and his friends were sure that it was a man made shaft but tired from their efforts, they ceased their excavation and covered the pit until found someone for assistance. It took some years but the trio returned to the pit. After 8 years, the trio began digging again along with The Onslow Company, formed for the purpose of search. They quickly reached the 30 foot marker that they had left earlier. At 40 feet, they found a layer of charcoal; at 50 feet, a layer of putty and a layer of coconut fiber at 60 feet. They continued till 90 feet. At this point, they found a three feet long and one foot wide flat stone bearing an indecipherable inscription. It consisted of strange letters and figures. 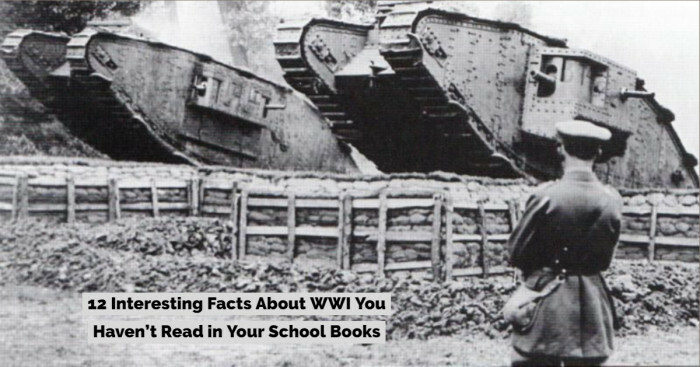 "Forty feet below, two million pounds lie buried. "Soon after probing with a crowbar, they struck something really hard, one that they hoped to be a treasure vault and went to bed with the expectations of owning a fortune next day. The next day, pit was filled with 60 feet of water. Even bailing the water was useless. As soon as the water was removed, more water flowed into the pit and all their attempts to pump out water failed. A tunnel was also run over to The Money Pit but the water flooded and they were forced to discontinue their search, which remain abandoned for 45 years. A new corporation Truro Company was formed in 1849 to finance the dig. The group faced the same problem of flooding that was present in 1802. They used a drill to get through the money pit floor. It bore through various levels of oak, clay and spruce and one sample of chain was recovered, which appeared to be made of gold. But these were also inundated by the salty water of the pit and the work ceased in 1850. Some other operations continued during 1858 to 1862. A workman also lost his life by a ruptured boiler. The Oak Island Association attempted to intersect the tunnel that fed water to the pit. A 120 foot shaft missed and another three by four foot tunnel was extended about eighteen feet to the “Money Pit” but water came again. A massive bailing operation was then carried out and suddenly there was a loud crash. It was assumed that the money pit collapsed but later it was theorized that the chests fell into a deep void and the pit may have been bobby trapped for protecting the treasure. Oak Island Eldorado Company followed the Association’s work in 1866 but did not generate significant results. Decades elapsed and the Oak Island Treasure Company located the pirate tunnel in 1897 that led to the Money Pit from Smith’s Cove. They drilled and dynamited. 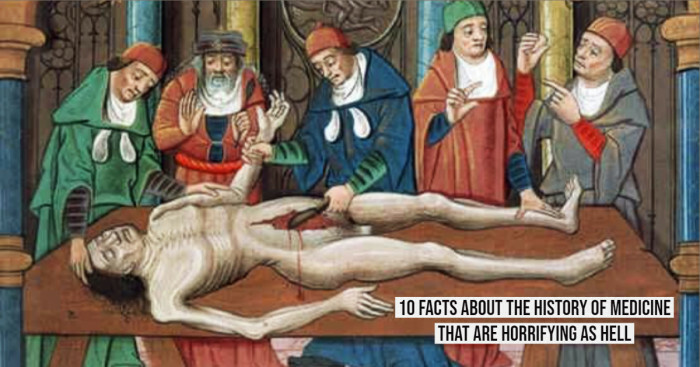 They also highlighted various borings. And found traces of chalk like stone or cement. Another worker lost his life in the same year during the excavation process. The company ran out of funds and closed its operations. Most of its movable assets were sold in 1900. The next century continued with the searches, digging, drill holes and tunnels. It was done on such a scale that the entire area changed completely from its original appearance. All those charts and old maps turned to be useless. There was another tragedy in 1965 when four men died in a shaft because of swamp gas or engine fumes. Dan Blankenship, a Florida based building contractor teamed up with David Tobias for the quest. They again began various drilling operations on extensive scale in 1966. They dug sixty bore holes in the following year. They enlisted various investors in a syndicate named Triton Alliance. Mechanical problems, land disputes, stock market crash of 1987 and various other troubles led to the two partners falling out. Their $10 million ‘big dog’ was stopped. The treasure has been a target of many clairvoyants, channelers, dowsers, automatic writers, archaeologists and various assorted visionaries. The inventors of devices like “Mineral Wave Ray” and the airplane borne “treasure smelling” machine also turned themselves towards the Oak Island Money Pit. This was the earliest theory which stated that the pit held a pirate treasure buried by Captain Kidd. Folks say that a man on his deathbed in the early 18th century confessed to be a member of his crew and states that they had buried several treasure chests on an island located in the east of Boston. 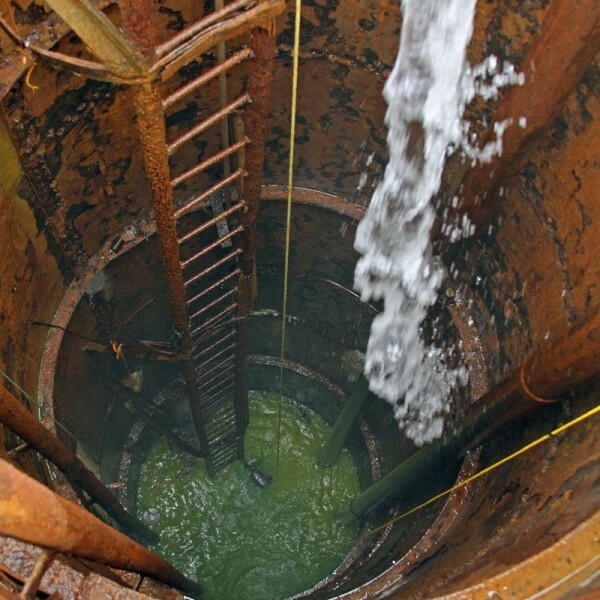 Joe Nickell argues that the pit is a natural phenomenon and there is no treasure inside. It may be a sinkhole connected with caverns or limestone passage. These suggestions date back to 1911. Various other sinkholes are also present near the island. The resemblance to a man made pit was suggested because of the texture of naturally accumulated sinkholes. In man made pits, the filling is softer than the surrounding ground which gives the impression that it has been dug before. This explanation suggested that the pit was dug to hold treasure but this was done by pirates. It may have been done by Spanish sailors or British troops during the American Revolution. A recent theory proposed that British marines constructed the pit to store their loots acquired from British invasion of Cuba. Author John Godwin also argued that the size and complexity of the pit suggests it to be dug by French Army engineers to hide the contents of the Fortress of Louisbourg treasury after losing from British during the Seven Years’ War. Penn Leary in his 1953 book The Oak Island Enigma: A History and Inquiry Into the Origin of the Money Pit contended that the pit was used to hide manuscripts which showed that Francis Bacon was the author of William Shakespeare’s works and the leader of Rosicrucian. Another book by Leary "The Second Cryptographic Shakespeare" that was published in 1990 identified ciphers in Shakespeare’s plays and poems that pointed towards Bacon’s authorship. 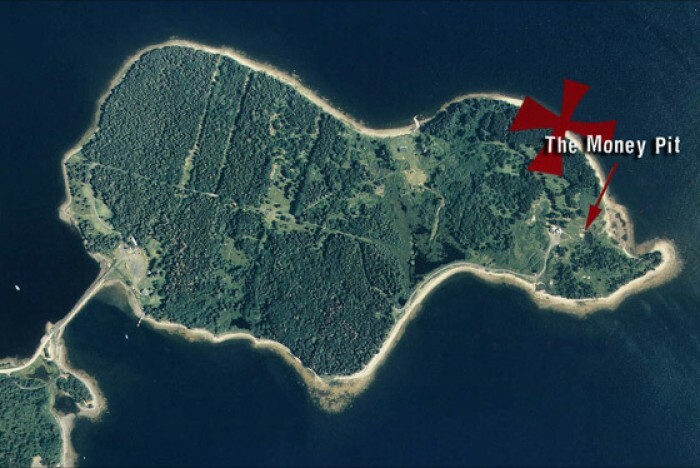 Some speculated that the Rosicrucian secret society organized a secret project on Oak Island. They believed that the legendary vault concealed ancient manuscripts and artifacts. Some researchers and cryptographers also claimed to have found the hidden codes in Shakespeare, varied rock formations on the island and hidden clues in the historical documents of 16th and 17th century. 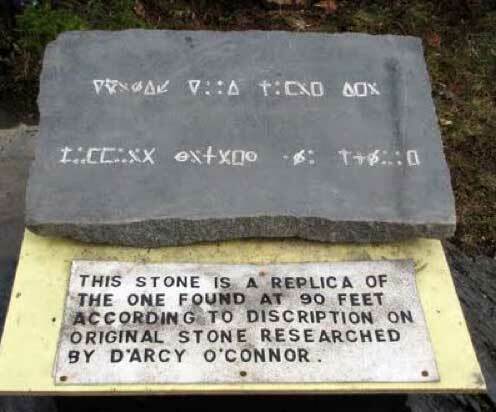 Daniel Ronnstam also claims that the 90 foot stone is a cipher created by Sir Francis Bacon who was a master cryptologist. In Mark Finnan’s book Oak Island Secrets, he noted that Oak Island had Masonic markings and the pit replicated some aspects of Masonic initiation. Joe Nickell further pointed out similarities between Oak Island and the allegory of ‘Secret Vault’ in Freemasonry. The most comprehensive treatment of Masonic aspects on Oak Island till date is given in the article "The Oak Island Legend: The Masonic Angle" by Freemason Denis King. There is a story that the jewels of Marie Antoinette which are missing (except for some specimens kept in museums worldwide) are present on Oak Island. During the French Revolution, on October 5, 1789, an angry of Parisian working women marched on the Palace of Versailles. Marie Antoinette instructed her maid or some other lady to flee away with jewels. The story says that the maid along with jewels and some other treasures like artwork and important documents fled to London and Nova Scotia from there. Through her royal connections, she managed the construction of a pit on the island in a contract with the French Navy. This theory lacks documentation; it is only folklore. No official date of construction exists and it is still questionable if such complex engineering could be completed in that small period of time. Another theory says that the pit was dug by exiled Knights Templar. It might be the last resting place of Holy Grail or the Ark of the Covenant . 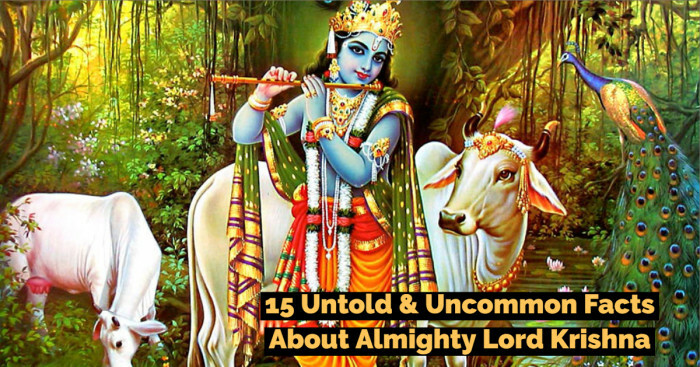 "To escape contagion of plague and winter hardships, he is to pray for an end or mitigation the Arif: The people will perish in misery if they forget the Lord, alas." He also said that optic migrants sailed from North Africa to Oak Island and constructed this pit. 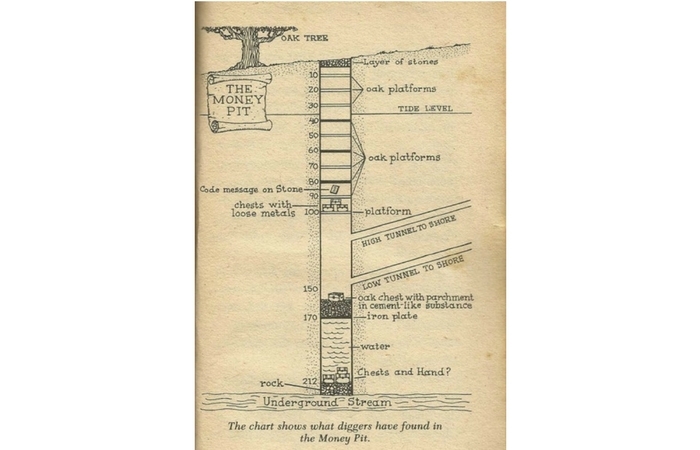 According to Joy Steele, money pit was actually a tar kiln in the historic period. Oak Island was a tar making location in the British naval stored industry, Joy Steele further said. Human made structures existed under Oak Island was also claimed by Lee Lamb. But she could not conclude if these were constructed by the people who hid the treasure or were the remains of various excavation attempts carried out by different people.